Constellations: Boötes -- Hunter of his Mother, or Inventor of the Plough? One story of Booetes identifies him as Arcas, the son of Callisto and Zeus. You can read that story by clicking here. One only needs to add that Booetes is Arcas before his transformation, and that Arcturus (Alpha Booetis) is named after him, meaning "keeper of the bear." Booetes itself comes from the Greek, meaning "ox driver." Not just any ox driver, of course, but the first one who thought of attaching a plough to his ox, thus making farming a lot easier. The gods rewarded him with a place in the sky for his efforts. Thus, we picture Booetes in two ways: First, hunting his mother, Ursa Major, with the aid of his dogs. Second, ploughing the sky with the help of the Big Dipper, known in some areas as the Plough. Unfortunately, we don't know where his ox is. 73k JPEG NGC5248 (Caldwell 45) is a bright (mag. 10.7), large (6.8'x5'), elongated (P.A. 110°), spiral galaxy with a bright core. Larger scopes should look for the bright patch of nebulosity in a bright lens. Also, several dark lanes. You find it in the far south-west corner of the constellation, and in the bottom, left of the picture. IC900 is the mag. 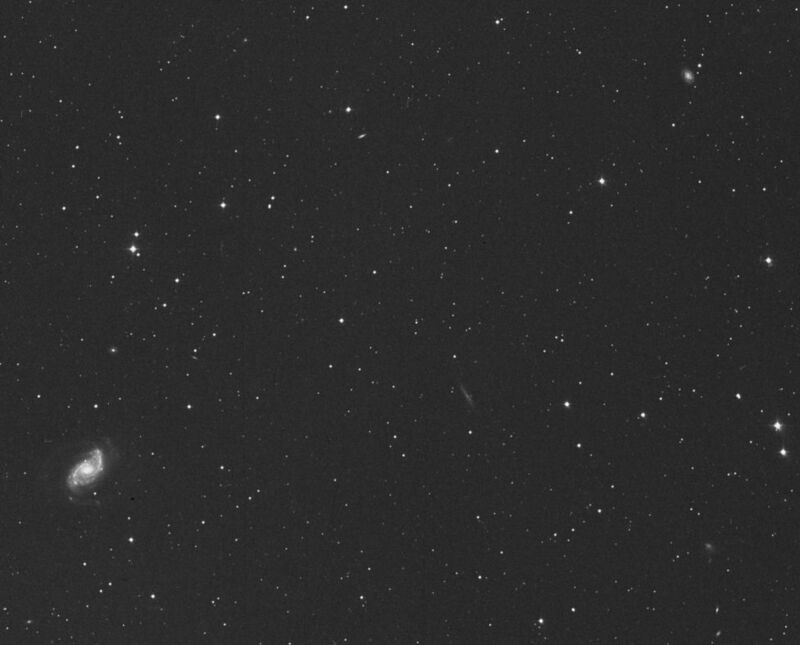 13.8 spiral galaxy in the upper, right. Many other galaxies inhabit the picture.